For Sri Rama Navami I would prepare payasam for puja naivedyam. This year I decided to go for chana dal payasam(we call it Kadalai paruppu payasam). 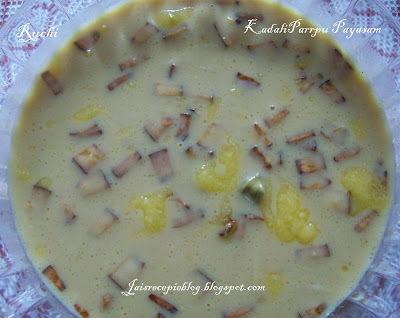 Its long time since I prepared it.It is one of the favorite Payasam in my home. 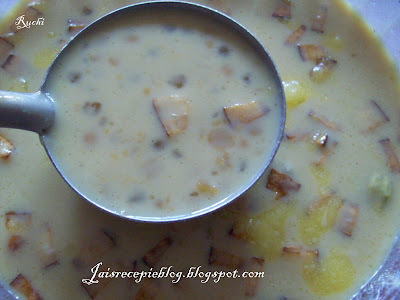 The payasam is a combination of chana dal, sabudana cooked with milk in jaggery syrup. . For giving a unique flavor to the dish, coconut, jaggery and cardamom are used. It is an easy to cook & a very simple but ultimate satisfying dessert. It can be enjoyed either hot or cold. Roast the chana dal till it becomes red. Wash the dhal and Add 2 cups of water, mix well, set to boil, Cook on low heat, stirring continuously so that no lumps are formed. Make sure the dal still holds its shape, so its very important not to over cook it. In a small vessel put the sabudana with one cup of water and cook in low heat until the sabudana is cooked through. Keep it on side. Grind the grated coconut and take the thick milk. Take milk from the coconut thrice. Keep the thick milk taken 1st, aside. Add the 2nd and 3rd milk and the jaggery solution to the dal. Now take a vessel, add one cup of water with the jaggery and boil till the jaggery melts. Then add the cooked dal & sabudana, Let it boil for 5 minutes.Then mix and add the coconut milk. ( Add the 1st milk to the payasam ). The dhal should not boil after adding the milk. . Heat a pan wihth ghee and fry the coconut flakes and cashew nuts. Add a dollop of ghee & cardamom powder for a special taste. Serve chilled or hot. Finally add the handful of dhal which was kept separately to the payasam.This gives a nitty gritty effect to payasam.Mix well and remove from fire. If the final consistency is too thick can dilute using milk.Instead of coconut milk we can add milk also. This is my mom's fav..Looks delicious..
woo looks fantastic...lovly dessert on the special day.. This channa dhal payasam is our native special i guess. I too tasted it many times in our hometown. Urs look delicious dear. I remember my mom makes this exactly like this!Yummy with those coconut! payasam looks yummy and so inviting jaishree. kadal paruppu payassam, looks yummmmm; that's a delicious drink! how are you Jaishree? Hope you're enjoying your summer vacation! Lovely payasam! Hope u had a wonderful celebration! Nice to you all like this dish.